We are travelling again to Hoi An this year (June 2016) and will stay at the Victoria. The beach suites are fantastic, spacious and very well appointed. The breakfasts are to 'die for' and the staff very friendly. Nothing better than laying on the beach, swimming in the warm sea, and returning to the lounge for a cocktail (or three). Riding a motor scooter? 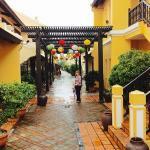 rough but fun from Victoria to the markets and shops in Hoi An. So Victoria is certainly not the newest kid on the block in the Hoi An, Danang resort boom, but what they do they do exceptionally well. The report is a classic, fantastic old world charm, with a village feel. Sadly there is not much left of the beach, but this is hardly the hotel's fault. I was really impressed by the extra mile that the staff went to recognise a birthday in our party, by presenting a cake whilst we were eating breakfast. It is these small touches, that I really feel make a great hotel! This pretty colonial style hotel is situated among tropical gardens and offers a peaceful retreat that is perfect after a day of exploring the temples. The staff was extremely helpful. The rooms are large and very clean. The bathroom are spacious and well appointed. The dining offer French and local Khmer dishes with both indoor and outdoor dining. .There is an outdoor pool with a spa tub. This hotel has a beautiful pool with view of the sea, but also a separate beach. The rooms are spacious and have a lovely terrace. The layout of the hotel is cosy and quaint. There is a hotel bus that drives to and from the centre every half hour except during the hottest hours of the day. Price value this is a perfect stay. Room tip: Ocean view room you relaxing with the sound of the sea! Thank you very much for choosing Victoria Hoi An as your address of choice in Central Viet Nam. We were thrilled to read how much you enjoyed your stay, our facilities, and your interactions with our team at the resort. We will certainly pass your compliments to all of them and are sure they will be thrilled to hear about them. Once again, thank you for staying with us and are looking forward to welcoming you back to Victoria Hoi An in the near future.